Description: Annual herb or small shrub, 10–30 cm high, hirsute, glandular hairs present. Leaves subconduplicate, oblanceolate, 5–20 mm long, 1–7 mm wide, margins entire or with 1–3 small teeth, obtuse. 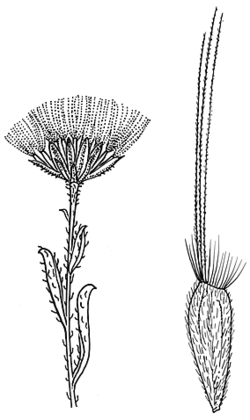 Heads 5–6 mm long; involucral bracts acute, ciliate at apex. Achenes 2.5–4 mm long, 4-angled with the centre line raised, often asymmetric with 1 or more prominent pustules near the base, with appressed simple hairs; pappus bristles 5–7 mm long. Distribution and occurrence: Grows on sandy red loam soils, in grassland or disturbed sites, north from Ingleburn.